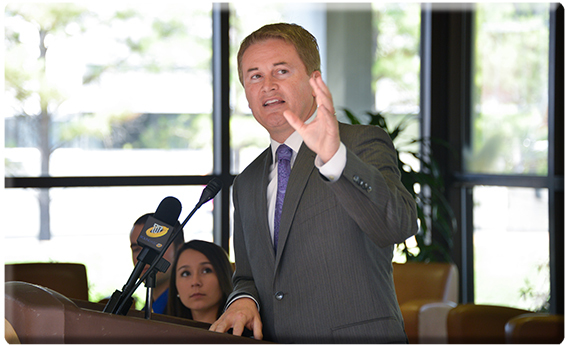 MURRAY, Ky. — Murray State University’s entry into the Kentucky Proud Farm to Campus Program is a milestone in the rich agricultural heritage of the Purchase region, Agriculture Commissioner James Comer said in a ceremony Tuesday on the MSU campus. “We are ‘Kentucky Proud’ to join the Kentucky Department of Agriculture’s Farm to Campus network of universities across the Commonwealth,” said Tony Brannon, dean of the Hutson School of Agriculture at MSU. “Working together, our Dining Services, University Bookstore, and the Cherry Exposition Center have identified several Kentucky Proud products that can be utilized in our operations. Farm to Campus is the official state program for connecting Kentucky farmers and food producers with Kentucky higher education institutions. Under Farm to Campus, the Kentucky Department of Agriculture helps participating institutions locate and procure fresh Kentucky Proud products to serve in their foodservice systems and shelf-stable Kentucky Proud products to sell in their campus bookstores. Murray State is the eighth Kentucky college or university in the Farm to Campus program, joining Asbury University, Campbellsville University, Eastern Kentucky University, Georgetown College, the University of Louisville, Morehead State University, and the University of Pikeville.